Days of the week calligraphy tutorial. 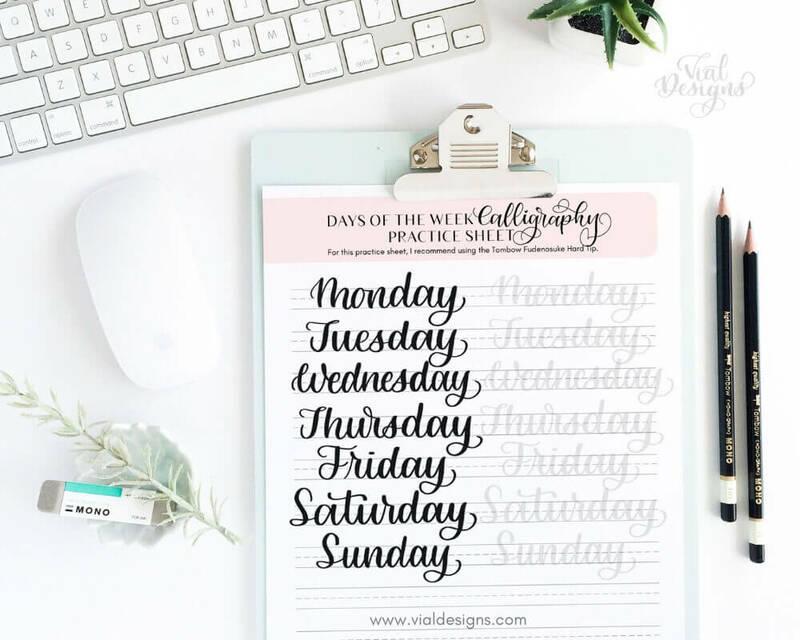 Learn how to letter the days of the week, plus get access to a FREE Calligraphy Practice sheet. A great way to learn calligraphy is by practicing writing new words. 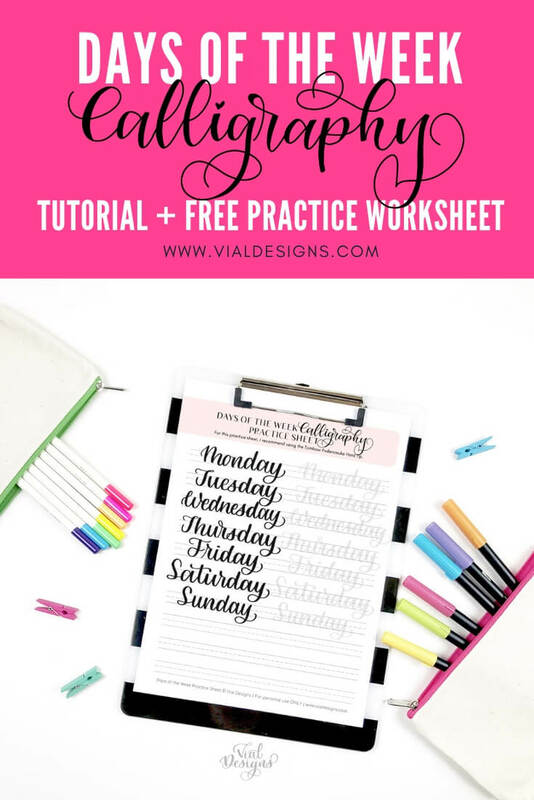 I want to help you do the same, and that’s why I created this FREE calligraphy practice sheet where I show you how to letter the days of the week. Last month, I decided to give the bullet journal system a try again. I’m enjoying this planning system because it’s helping me a lot to stay organized and more productive. One thing that has me excited is all the ways that I can apply my calligraphy and lettering skills into my bullet journal. 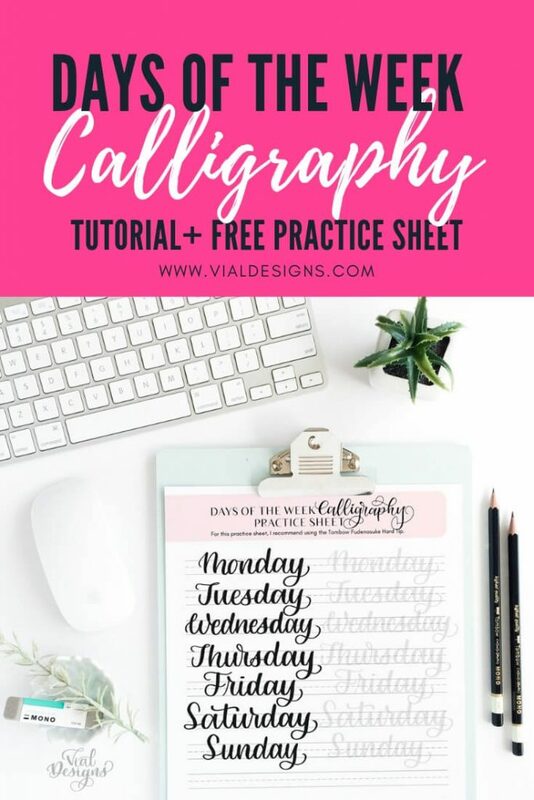 These practice worksheets will help you learn and improve your calligraphy so you can use your skill not only in your bullet journaling, but everywhere like making cards, signs, or simply note-taking. There are so many different ways you can use your calligraphy skills. Today’s FREE practice worksheet will be in resource library as well, and you can get access to it by filling out the form at the end of this blog post. If you have a word or phrase you’d like to use to practice your lettering, let me know in the comments. I’ll be choosing new words every month to create free practice worksheets. Paper: I recommend HP Premium32 Paper because if of higher quality, which is excellent for your brush pens. Or you can also use tracing paper and put it on to of your worksheet to practice. This way, you only need to print the sheet once and still practice several times. You can use any printer paper if you are using a regular pen. I ONLY recommend regular paper if you are doing Faux Calligraphy. Regular printer paper can shorten the life of your brush pens. Brush Pen (Small Tip): I designed these worksheets with the Tombow Fudenosuke Hard Tip in mind, which are the pens I recommend them for beginners. The Tombow Fudenosuke also come in a soft tip and different colors, so you have different options to choose from. Monoline pen: The Faux Calligraphy part of the worksheet can be done with any regular pen. I prefer the Staedtler Triplus Fineliner, which I use for my everyday writing. Or the Tombo MONO drawing pens. For a complete list of supplies I recommend for beginners in brush pen calligraphy, make sure to check this blog post. Fill out the form at the bottom of this post or go to my free resource library if you already have the password to get in. Once you’re there, select the practice sheet you’d like to download. 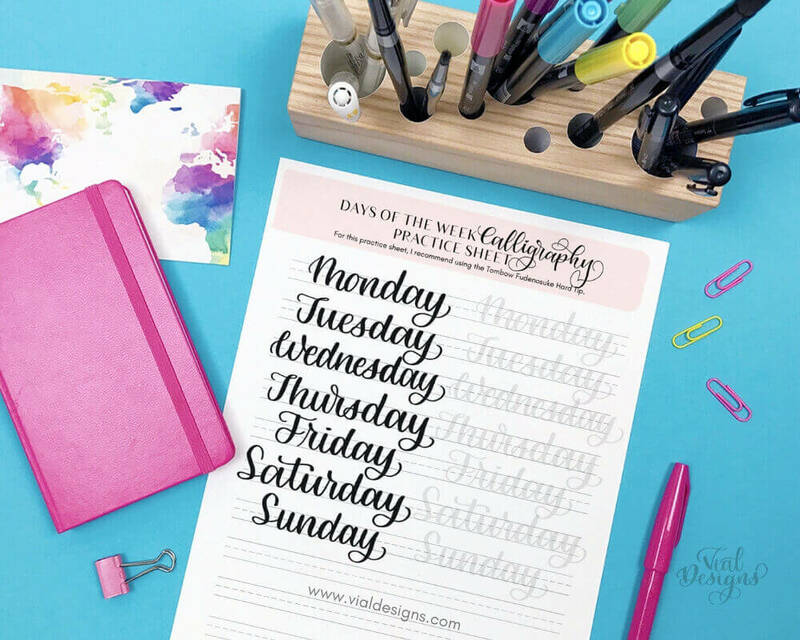 For this tutorial select the: DAYS OF THE WEEK CALLIGRAPHY PRACTICE SHEET. Once you’ve printed your worksheet, you’re ready to get your practice going! IMPORTANT: Slow down! As you are practicing, make sure to take your time. Doing calligraphy is not meant to be fast. REMEMBER: to use light pressure for the upstrokes (when you’re moving the pen upwards) and heavy pressure for the downstrokes (when you’re moving the pen upwards). Find a comfortable position and take breaks if you need to. Lift your pen between each stroke as you’re practicing the letterforms. You can also adjust your page anytime to get a better angle. Faux Calligraphy Worksheets for lowercase, uppercase, numbers, and symbols. These worksheets and all the files contained in my resource library are for PERSONAL use ONLY. They are original work designed, owned, and copyrighted by ©Vial Designs. You can’t alter, sell, or redistribute them. Re-distributing the PDFs/JPGs/PNGs violates digital copyright laws. If you love these worksheets and want to share them, send your friends directly to this blog post or my free resource library so they can have access too! 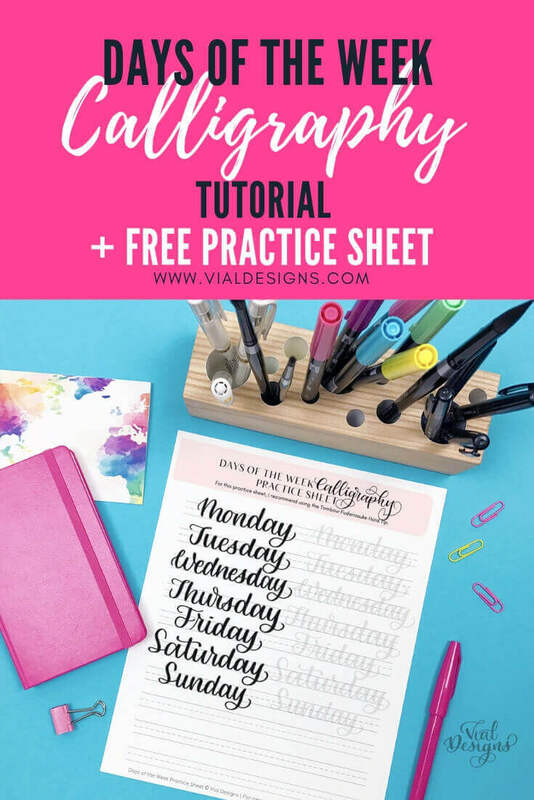 Get access to the FREE calligraphy practice sheet that comes along with this blog post by filling out the form below. 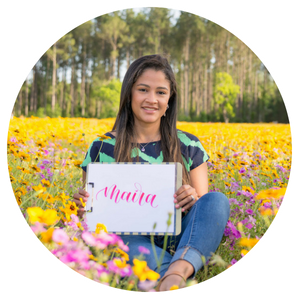 I hope you find this blog post helpful and you start creating calligraphy today! I’d love to see what you create and how you use your Practice Worksheet. Use the hashtag #vd_tutorials or #vialdesigns_blog. Don’t forget to tag me on @VialDesigns (on Instagram) or Vial Designs on (Facebook) so I can see your work.